The Bertha ceramic base table lamp complete with shade. An opulent oriental style table lamp with a deep red ceramic ginger jar style base that sits on a dark brown circular plinth. The base is decorated with a repeating bird pattern featuring beautiful tall elegant crane like birds in gold with black detailing. 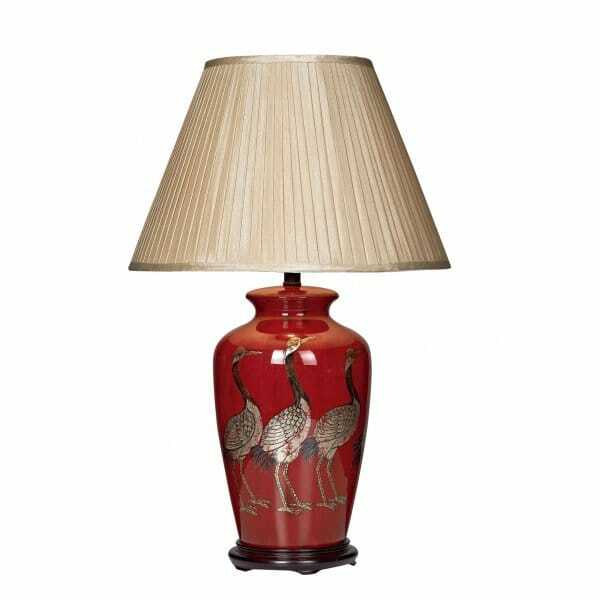 A super eye-catching table lamp to add a extra dimension to a traditional room setting. Supplied complete with the neutral taupe coloured pleated faux silk empire shade. The fitting is double insulated and has an in-line on/off rocker switch located on the cable for ease of use.